Olivia Newton-John apparently doesn't want Delta Goodrem to play her in a movie. It’s the battle that’s tearing apart Australia’s sweethearts! 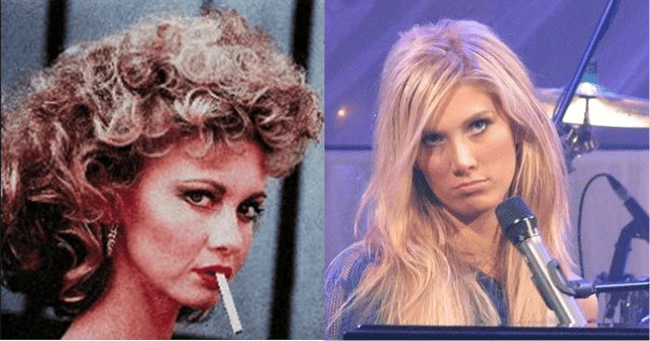 New Idea is reporting that Olivia Newton-John, 67, is peeved at Delta Goodrem, 30, over a proposed movie about Olivia Newton-John’s life. The mag says Newton-John, who is a longtime mentor and friend of Goodrem’s, sent a cease and desist letter to the production company responsible for the unauthorised film. “[Olivia’s] very upset and is not taking [Delta’s] calls,” an “insider” told New Idea. Now, we’re a bit sceptical about this. Question the first: Why wouldn’t you want long-limbed, golden-haired, honey-voiced Delta to play you in a film? Second question: What dirt could our Sandy possibly have to hide? Apart from that whole missing boyfriend thing, but nobody thinks that was Liv’s fault? He just…disappeared. Friends: New Idea reckons Liv isn’t taking Delta’s calls. Observation: After the success of bios on the lives of Ita Buttrose, Princess Mary, and Julian Assange, it’s only natural that the networks would jump on the genre. Olivia is our biggest star evah (outside Edna Everage), so you’d expect her to get the same treatment that Molly Meldrum, Paul Hogan, and Peter Brock are getting this year. According to The Australian, the Olivia Newton-John project has been greenlit by Channel Seven and is being made by Fremantle Media. It’s “fully funded” and casting is “well advanced”. We hope the possibly-non-existent rift between these sweethearts of our great nation is healed soon. Preferably through song.